I saw the new Disney live-action film “John Carter” this weekend. I liked it, I mean it’s not without some pretty obvious story and character flaws, but the mythology and world building was so much fun that I was willing to overlook the fact that the main character’s motivation is never truly defined. and I am 100% planning to see it again, mainly to transcribe more of the Barsoomian dialogue. Anyway, here’s as much as I was able to transcribe during my first viewing. (So glad I had my notebook with me!) I’ll update this post when I’m able to watch the movie again, because there are some lines I didn’t catch and it’s also possible that I didn’t hear everything clearly. (I’m pretty sure I confused some k’s and t’s.) And of course I’m totally guessing at word boundaries. ***update*** i missed my chance to see it again and it’s no longer showing at my theater, so i’ll have to wait for the dvd. it’ll be easier to capture with a pause button anyway. well I’m planning to see the movie again tonight, so hopefully I can update this post soon. OMG thanks for the language update. i was searching for the words ‘virginia’ used to teleport to barsoom. Couldn’t the first syllable of these two quites be the same? [sa]/[sat]/[ʤa]/[ʤat] could be some kind of negation to the verbs. great link, that’s very interesting and helpful. thanks! I lead the fan-based dicipherment effort for Atlantean from Disney’s Atlantis : The Lost Empire. No one’s said much on the “Martian Alphabet” yet. Now, back in 2002 Atlantean got me started in studying all writing systems, which eventually turned to all scripts and languages, and so about every 6 months I work with all writing systems, in a kind of capricious rotation. I make comparison charts and do studies, and read in them, this sort of thing. Now, I’m sad to tell you that I can tell clearly that Disney’s Barsoomian alphabet is based mostly on the modern English alphabet, just altered a bit to look ‘alien’ to untrained eyes. Its aesthetic might be based on the Huttese writing system from Star Wars, but maybe not. You can test my claims by using Omniglot and Ancient Scripts to compare alphabets and scripts, but it really takes a lot of work to have the trained eyes I have. I don’t plan on making a report, saying this is enough. Quenya was interesting (based on unicial Latins) but too artificial to be realistic. Klingon was actually based on Phoenician, but its IT geek base never figured it out. Most sci-fi alphabets are ciphers based on Phoenician. Atlantean was a real step up, being based on Futhark AND Phoenician mostly, and then a few things from from many different writing systems, various Chinese scripts included; and even the non-Afroeurasian Mayan. For Barsoomian, they put so much in the language and nothing in the writing system. And you can’t even download the font yet, though I don’t know when you could for Atlantean, as I got into fonts and languages about 2006. Heed my advice, don’t do the work for them and buy the merchandise and encourage others to learn the language. Learn real languages and seek reality. These movies just tell lies about how life works and lead people to Hell. I eventually learned real languages and became a traditional Catholic under the Institute of Christ the King Sovereign Priest, got a BA in Linguistics, taught at universities in China and Cambodia, married a Filipina, and now have 2 kids and counting. Among other things,wholesome, positive relationships don’t proceed the unchaperoned manner of Titanic or Avatar; that leads to fornication, adultery, divorce. Instead of movies, read the Catechisms of Trent and Baltimore, and read the only real Bible, the English, Catholic 1582 on Saints Books . Org. Much higher quality conlangs for which you don’t have to do the work, can be found on Zompist Bboard and Frathwiki. Conlangs are a very good tool for learning and understanding languages, but taken too far they can be harmful. Understanding, interacting with reality has good results. The world isn’t the way we or someone else wants it to be. For the latest dicipherment presentations for Atlantean and other writings and findings by me : linguistic theory, ancient and modern language corpora, philosophy, you name it, search “sumerian corpus” on Scribd or especially wePapers. Cyril, thanks for your input. I’m not really interested in scripts, since they are often not representative of the actual language, and a language doesn’t need a written form to be legitimized. I think deciphering constructed languages is an enjoyable pastime that I happen to have some of the skills and training to be able to do. For me it is not a replacement to studying existing human languages, but I don’t see how it could be a bad thing for lay people to get excited about the fascinating complexities of human communication systems, even if that passion is sparked by something other than a natural language. I certainly don’t think there is anything immoral about taking an interest in conlangs, and despite your statements that we should “seek reality” you have obviously spent a good deal of time and energy just to respond to this post, so I’m not sure why you make that argument. For Atlantean, we had the script containing side-by-side English translations of a lot of Atlantean. All the Atlantean in the movie was real Atlantean, too, which I just diciphered in the last few years, though without English translation, the dicipherments are hazy and uncertain. I developed methods of making new words and use them to this day every few months when I want to write something in Atlantean. But Vulcan, from 1980s Star Wars, had no script, nothing. Mark Gardiner with some others transcribed it and assigned meanings, then made up new language (lexemes to syntax) for it as much as he wanted, producing a masterpiece. Likewise, in about 2007, Rajki took Star Wars Huttese (actually Polish mixed with Quenya), transcribed, assigned values, then added some language to fill it out, using Quenya as a source. This is called “developing” a professional orphaned conlang, and I think it should be done more often, especially to Tolkein’s Dwarvish and the Neo-Dwarvish. Unless Fromner releases his word list, someone can assign words according to what he said, and go from there. The problem with developing conlangs is that it requires at least some reading in their literature, otherwise you mess it up. Be efficient, but don’t take much time doing it. Such work is an impetus for learning more about reality, about real languages and real writings and what they mean and how they say it. For example, I did some reading, then after a year of stewing, I created a 600+ sign (glyph) hieroglyphic Klingon writing system which I have yet to put online. It’s visually different from any human hieroglyphic, and combines evenly aspects of all human hieroglyphic writing systems, also doing possible but undocumented things. And it’s better than the language itself, yet I didn’t have to watch every episode or read every book, just search the free online stuff for what I needed to know. And it’s workable and fun and very smart. This, and an organized presentation, are the hallmarks of a good conlang or script. The smarter, the better, though there’s a balance. The problem with using a writing system or language which is almost exactly like English is that it’s like running a few meters after training for months on 4 miles at a time. It’s no exercise. But then again, a real language is like running a marathon : some people also want something challenging but light (lite). / Enough by me, you get the point. Dig-esh Adlantis-ag tipim-mi-l nal-ten-in basheb gim kudob-g-ek-ik, yos dos yasek-ek-ik. / Language-INSTR Atlantis-GEN small-ADJ-SG time-continue-ADV speak-0.INFIN and write-ABLE.ASP-PRES-1.SG, COORD.SUBJ when decide-PRES-1S. / I can still speak and write in a little Atlantean, when I decide. ( ten < tenit 'to continue') / Atlantean : SOV : WORDS Mostly Germanic, Slavic, Romance, then PIE, with some of everything, even Mayan and Tillamook. SOUNDS / SYNTAX Most common features of all human languages, yet follows Greenberg's universals, agglutinative, Noun Adj, Adv Verb. // I only remember it from working so much with it over the years, comparing cognates, etc. Find “Corpus Presenter” and download it online for free, or use an online word frequency counter, it would help a lot. Watch out for situations where you might have mistranscribed or where the actor mispronounced or correctly pronounced an allomorph. And regarding your welcome response to my posts, I was trying to draw the fine line between a good use of conlanging (I think there is one) and bad use of conlanging. And regarding Biblical translation, there is also a line between legitimate translation and immoral manipulation, one which I have found by examination to have been crossed by all but the 1590 Vulgate and that 1582/1610 Catholic translation, also on my Scribd site; regarding the old reference texts and the modern translation only into English (not German or Spanish). This has been my finding (and Jay Green, and a minority of scholars) after many years of comparing the old languages with eachother and with English translations. To clarify. What’s most important for my next Reply is that I do think there is a “good conlanging”. Anyway, so I’m not finding anything more out there on this, so I hope I’m missing something. What I want with this is just something for the linguist / conlanger community, not to have a bunch of people actually learning, using the language, and getting more into the books and movie. It’s just that this was a good place to showcase conlanging and the development of conlangs, and the critiques serious conlangers have of the movie conlangs we’ve seen recently. This is the same guy as above, “Keran Shadlag” of Atlantean. – “developed” the language by including all internet book-based Barsoomian (like from Langmaker’s site), AND THEN assigning values to the undicipherable portion of the movie corpus using Frommer’s statements on his language’s words, syntax, morphology, etc. I also included everything I could find by the Conlang Librarian, as I thought his work was good. *I did not view the movie even once, only worked from what was online already. This “corpus dictionary” is sortable Martian – English and English – Martian, along with by word frequency and a couple other categories ( part of speech ). I have also produced some commentary on what I had to work with and how I made what I did. What I was hoping in all this was to give inspiration and help to conlangers by making a highly-visible presentation of the Excel format I developed over the years, as well as my thoughts on neographies and other conlang-related topics, using Martian as a showcase. Also, just as you can look up Dothraki, Gardiner-Okrand’s Vulcan, Klingon, Elvish, or Atlantean online and see how they work and maybe compose a few poems, so now you can do the same for Martian. It’s not meant to be definitive, just part of what’s out there,hopefully helpful. This was an opportunity for me to see how Frommer handled Na’vi, as I hadn’t actually done so yet. There’s an unofficial dictionary which outlines his method of feeding clues to the “fan community” and letting them dicipher it for themselves, then correcting their mistakes. As much as I have so far fed into this, I dislike it. Conlangs should be presented, not teased out as a “viral marketing” advertisement campaign. I hope potential dicipherers heed my warning and see that it seems like Atlantean, Na’vi, Dothraki, Martian/Barsoomian are moving away from Elvish / Klingon and into the trend of “viral marketing / fan dicipherment”, which I consider a waste of time. I’ve falled into the trap twice now, but I want to raise the issue of how much is too much for professional conlanger and fan-dicipherer. I also want to voice my disapproval of making a movie from the “Princess of Mars Books” as they are not only fiction, but also the kind of pulp against which Tolkein stated in his letters that he wrote his books, saying something like, ‘Kids read such evil books these days (probably Lovecraft and Borrough), I want to make something better for them to read.” The Inklings, and Lewis, also tried to counteract the pulp movement. In particular, the books’ cover illustrations and the second book’s unrealistic inferences about all religions here on earth (like Asimov’s delusions, sprinkling his works) are potentially-harmful lies. The problem with fantasy and even non-fiction is that people do use it as if it was reality, when in fact it is often very far from it. How I justify developing Martian is that it’s none-the-less apart of the conlangs that are out there, and not entirely unlike Elvish or any other conlang in content or source. Again, I usually use the “Excel corpus dictionary” format, FontForge, and my other tools and skills for studying The Bible, the Tridentine Mass, and other Catholic texts, texts which are completely true, reflect reality perfectly,and with proper understanding, lead to health of soul and body. So that’s my usual research agenda. Also, I was disappointed with the Na’vi movement in that it did not study my example so well and present an interlinear corpus, or what’s more, a concordance to assist in checking dicipherment, etc, all of which my “corpus dictionary” provides. As long as the dicipherers are learning and showcasing dicipherment skills, I want them to showcase good ones, for their sakes and everyone elses’. Again, expect my dicipherment-development within a week or two on either Scribd and/or wePapers, search “Sumerian Corpus”. I’m really impressed with all your scholarly work, and grateful for your efforts. Actually, I came across your site while trying to find out if anyone has made available the Barsoomian alphabet Disney has used in some of their promotional materials. (I didn’t know it WAS an alphabet, till I saw the infosheet they’ve issued about Woola. And here the symbols are all over the back of my John Carter t-shirt!) I feel like I’m sticking my nose into a conversation that may be above my head, but I believe that Dotar Sojat more precisely translates to “my right hands”. After all, Tars has two of them. Just thought I’d mention it. Carry on the good work. intial question-word : ?o , but there are some sound-alikes with different functions. Nar tu gheb nu-n thaala, Jeddak? May I make it-OBJ dead, lord ? V.mod 1SG CAUS 3SG-OBJ ADJ, vocative ? With the additional Martian and the exact transcribing, it was much much harder to develop (not dicipher so much), because there’s all these places where the corpus overlaps, but I managed something in a reasonable amount of time, trying to match what Frommer said exactly. Other grammatical categories I diciphered / developed (though marked clearly in the document, the line between the two does blur in some cases) : Proximate Distal Singular Plural (No gender, no noun classes, unless you count what vowels a word has for its plural formation) “Future” “Past” “Present” (exactly what, I don’t know) Imperative Negative POS Modal Verb Noun Adjective Preposition (mostly) Postposition (1) Locative.suffix(? not frequent) quasi-Real quasi-Unreal Honorific (pa thou pa-i thou-HON Pronouns : SG 1 2 3 PL 1 2 3 tu pa ki / nu // du ba gi / * :: thing-SUBJ ‘wa’ thing-OBJ wa-m no-thing(s) ‘d-eg’ *Something like this. * I hope this further preview is welcome, I tend to be overly-verbose. Also, I thought the movie was actually the best sci-fi / fantasy / adventure of all time, because it combined not-much-immodesty, ubiquitous pro-marriage values, with ultimately more-than-enough action scenes out-doing even Matrix123 (esp. JC vs. Warhoom, wow). Well, thanks for starting this, PageLady. It seems a phonetics professor (you) were the only person in the world willing to brave transcribing lighting-fast dialogue and subtitles. Is this how Na’vi dicipherment started ? It was like this (about 10-20 more people) at the beginning with Atlantean. It’s part of the big-time conlang heritage now, and it’s not as bad as Blade (Wesley Snipes). I just so surprised with all the conlangers out there, there isn’t more interest from them in the movie- or novel- conlangs. John Carter’s Martian name, from the surnames of the first two warrior chieftains he killed. – APOM , Movie [ Doo tar soo jat ]. “My right arms ! ” means “You guys, my tribe, are my right arms !” Then they all cheer because William Dafoe is such a good actor who might be type-cast as Green Goblin. The above was wrong : ‘tet’ is Negative and it goes after the verb. It also occurs in d-eg ‘no-thing(s)’. Also, I’ve been saying that jeddak is non-canonical and it actually is, but I don’t think sak is (it’s sac). / I also posted my position on that Facebook page, I’m going to release my work for the sake of conlangers and people I might reach by saying my bit and explaining the language. Most of my troubles have been with the ‘development’ of the language, the assigning of values to stuff we can’t be sure of. It’s been interesting to consider the concepts under consideration and write what I’ve read about them these 10 years since Atlantis: The Lost Empire helped me get interested. Conlangs, whatever their source, especially if they aren’t innately evil, are really useful for that. Okay, I’m not done yet, but I hope to make a presentation of some of the incomplete materials tonight. Later I’ll give a more finished product. It’s taking some time because I want to 1 document all of ERB’s (proto-) conlangs (words only, no sentences) (there’s one for each major series), study them a bit, and use them to critque Frommer’s vision. I even found a site to host my fonts. I’m also planning on translating the entire movie into Martian, because that’s what a real conlanger would do, and what Frommer should have done, was he a conlanger in his heart. But he’s better than Okrand, may I be so bold. Frommer cares more, but not enough. He’s still not your run-of-the-mill devoted conlanger. I was finding all sorts of stuff in the corpus (caused by actor mispronunciation ? or real ? ), and I present all my theories in one grammar, but I for translating the movie I’m going to use an extremely simple grammar that still follows Frommer’s and ERB’s words as exactly as possible. I’m sorry to have kept who’s ever been waiting for my work waiting, but it takes some time. It turned out when I checked, he said “verb agreement”, and that caused more problems than you can imagine. i would bet that there are definitely inconsistencies caused by actor mispronunciation. 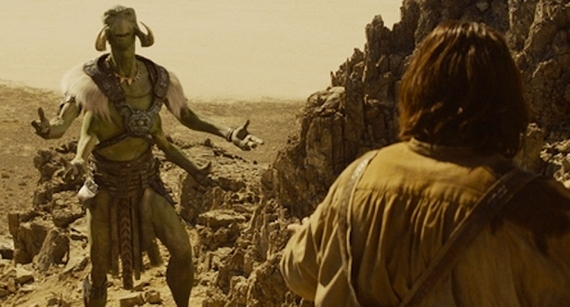 as i said in my “Why John Carter Is Probably Still Stuck On Earth” post, (https://pagelady.wordpress.com/2012/03/18/why-john-carter-is-probably-still-stuck-on-earth/), the title character doesn’t even pronounce the crucial teleportation phrase the same way each time. as for why more conlangers don’t seem to be interested in deciphering Barsoomian, it’s probably because the movie didn’t do that well. not nearly as many people saw it as saw Avatar, and most people bashed it as a bomb. (I didn’t think it was that bad, I quite enjoyed it although it is undeniably full of laughable dialogue). Anyway, not as many people saw it and a sequel is very very unlikely, especially considering the recent news that Disney’s chief film executive resigned after John Carter performed so poorly. (http://www.bloomberg.com/news/2012-04-20/walt-disney-film-chief-ross-steps-down-after-john-carter-loss.html) so there is little to no chance that we will ever see a sequel where more Barsoomian might be featured, as opposed to Avatar which promises at least two more chances for new scenes with Na’vi, or something like Tolkien’s Elvish languages which existed richly before the movie adaptations. I’ll probably still spend a little more time on Barsoomian after the DVD comes out, but i doubt i’ll go as in-depth as you are. Looks like you’ll be the lone expert! I’m sorry not to have made any presentation yet. I hope to present this next week sometime, but it may be 2-4 weeks before I’m done. It turns out there’s a lot that needed to be done or begun with Edgar Rice Burrough’s proto-conlangs (he made up about 3 for each book series he made !). His major proto-conlang was Mangani from the Tarzan books. I’m going to post a description of my research thus-far to my Scribd and wePapers accounts for ANYONE who’s interested. / I’ve created a labeled Excel-based corpus of all of ERB’s works online (which is most of them, in public domain in Austrailia mostly), and made a word frequency list and concordance of the same using online software – Frommer and Disney did a pretty good job with Martian, but they did not have a searchable corpus like I’ve made. Forget it, I can get to town about once a month and the internet is not working in this country – the third world is awful, just awful (I’m not in America). I’ll upload it some other time. All I want to say is that I’m still going to translate the entire movie into Martian, that I made that corpus, and that I gathered everything online that people have done on his other proto-conlangs. I’m going to try also to post to Zompist. plus those other people who said stuff and did things that I worked from. reflect the choices I made for Working Martian. Here’s a guide on the font I haven’t uploaded yet. maybe it’s just me reading into it too deep. The fonts are up for now ! The way to use the Excel sheet is to sort it into the order you want it in (English – Martian) by ABC sorting that column. Or you could also search the document. To get back to normal order, sort by ABC the Column A. One column records what I heard while watching and rewinding the movie, another gives Martian word-to-a-line with English interlinear translation, while other columns give the Martian script or other information, described somewhere in my yet-unpublished writings. Here, now I’m going to start a Yahoo Group so I don’t have to post here all the time. ( The same address and hopefully name as the old Atlantean Language Group, which I had taken down.) And laymen, decipherers, or whomever is directed here. You have to have a Yahoo Account to join the group (automatic for now) and see the messages. Making a Yahoo Account takes two minutes thereabouts. I was able to get a few others up at the same profile on wePapers. Of particular interest, here is my labeled and searchable Excel collection of ALL the Edgar Rice Burroughs which are online. It’s c. 1912-1941 and it really is dated stuff, regular vintage. But his stuff is where all sorts of famous entertainment got its ideas : Super Mario Bros. is mostly the Barsoom Series, The Well of Souls from Raiders of the Lost Ark is from The Chamber of Reptiles in Gods of Mars, etc, banthas, the Sith, Jedi, stuff like that. He’s a very pagan writer, though he hides it a bit. Very neo-/post- Romanticism-Gothic-Victorian etc. But remember these are all rough products !!! instead of “Atlantean Langauge Group”. I only want one main Yahoo Group for when I need a private forum, and I’d rather it be named with the overall tenor of my research. Hi, I have a dear friend whom i call Mars (because she is so different than a lot of us here :P) whose birthday is approaching. I want to give her a greeting card and would like write “Happy birthday! Hope you are enjoying your stay here at Earth – Your Dear Friend – Raja”. Can you help me translate this into Barsoom script? Raja, I can’t help with the script but if you go to this link it will translate anything from English into Barsoomian writing style. http://disney.go.com/johncarter/splash-page/#/translator It won’t let you copy the translated text but you could do a screenshot, and it gives you the option to send the coded message via facebook or twitter. I can’t really translate the phrase into what I know of the spoken Barsoomian either, since we’re not given words like “birthday”, “happy,” “hope,” “enjoy,” etc. But Earth is “Jasoom”. Can I just say what a relief to uncover a person that genuinely understands what they’re talking about over the internet. You actually know how to bring an issue to light and make it important. More people ought to read this and understand this side of the story. I was surprised that you are not more popular given that you certainly possess the gift.